Some of the most popular modern collectible coins are the one ounce silver coins struck by various countries around the world. Generally struck in either circulation strike format or in a special format (such as proof or specimen strikings) more targeted towards collectors, these coins often feature distinctive and unique designs containing elements of the country from the country of issue. There are a number of countries which have produced these one ounce silver bullion coins since the early 1980s, while other countries have only recently added these types of coins to their numismatic releases, generally selling them for a premium over the silver content. Perhaps one of the most well-known bullion series is the American Silver Eagle program which started in 1986. Struck in 99.9% silver, the weight and fineness are guaranteed by the United States government, making it a very popular coin with silver bullion investors. The bullion version generally trades for several dollars over spot value, which is still reasonable, although the Proof version usually sells for around double that amount or more. The proofs have been produced yearly and come in special individual packaging. The bullion coins come in boxes of 500 coins (called “monster boxes”) which contain twenty-five tubes of twenty coins each. Special collector versions have been produced in 1995, 2006, 2011 and 2012, most notably in the latter three years when a so-called “reverse-proof” version of the coin was issued. The design has remained the same since its introduction in 1986. 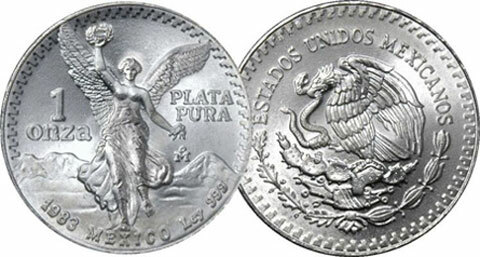 The Mexican Libertad can be considered to have been the first modern one ounce silver bullion coin. Introduced in 1982 in a one ounce version, it is now struck in minor versions of 1/20, 1/10, ¼ and ½ ounce coins, plus larger versions of 2 and 5 ounce coins as well as a kilo version. Like the American Silver Eagles the Mexican Libertads are struck in 99.9% fine silver. Proof versions have been sold in limited quantities and trade for a premium over the silver content. Two different designs have been used, with the first type in use until 1995 and the second type from that year on. Like the Silver Eagles, the one ounce bullion strikes sell for a relatively modest premium for the most common years, although there are a few exceptions depending on the total mintage. Perhaps one of the most popular modern coin series, the Chinese silver panda series has been produced since 1983. Initially offered in extremely limited quantities to collectors in a one ounce version, the series has expanded to include 1/4 and 1/2 ounce coins (struck rarely) as well as larger 5 and 12 ounce coins and recently kilo coins as well. The design changes yearly, although some of the earlier years had the same design for a few years, as well as the 2001 and 2002 issues. Special releases include gold plated pandas, special strikings for Chinese companies (often banks), as well as Panda medals that are generally collected with the series and are usually released in conjunction with numismatic expos around the world. All issues trade for a strong premium over the silver content and Panda’s are usually not bought by investors seeking mere bullion coins. Marketed as the purest silver bullion coin available on today’s market, the Canadian Maple Leaf has been produced since 1988. Struck in silver composition of 99.99% fine it comes in a variety of different formats. Uncirculated coins are packed individually while special collector editions often come in packaging ranging from plastic boxes to gilded wooden boxes. Like the commemorative coins that the Royal Canadian Mint produces, the total number of special maple leaf releases is very high, making it virtually impossible to collect them all without unlimited funds. Some of the more noteworthy special editions include a 1998 10 ounce coin struck to commemorate the 10th anniversary of the series, a piedfort version (a coin struck on a planchet of double weight) released in 2010, as well as many coins with special privy marks. These latter versions have a special imprint generally in the field commemorating a special event or person. The series was further expanded in 2011 with the introduction of a one kilo silver maple leaf coin with a limited mintage. 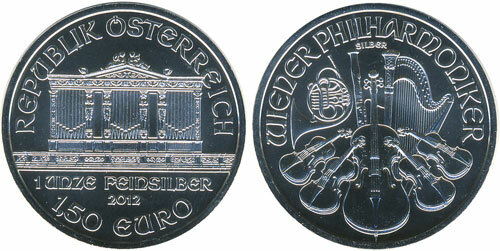 Another coin which is popular with bullion investors is the Austrian Philharmonic. 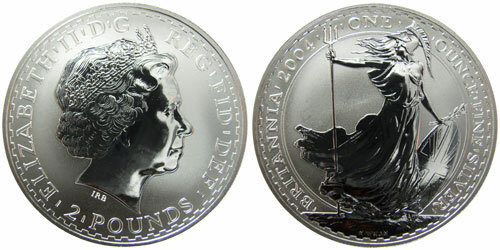 First issued only very recently, in 2008, it shares the design with its gold version which was introduced back in 1989. The design features very historical elements native to Vienna, where the coins are struck. No special versions have been released yet, making it one of the more affordable series to complete, with a full set feasible for a relatively small premium over the bullion value. They generally come in tubes of twenty coins each, packed in simple boxes of twenty-five rolls. First released in 1990, the Australian Kookaburra was that nation’s first one ounce silver coin. One of the most frequently changed bullion coins, its design has changed annually since it was first strike, while the face value was lowered from AU$5 to AU$1 in 1992. From the beginning production included both uncirculated and Proof versions, while later on gilded and colored versions were added, and similar to the Canadian maple leaves privy marked coins have been released as well. For much of the series, mintages were generally limited to 300,000 pieces for the one ounce size coins, although in recent years the limit has been increased. Currently, the coins are available in 1 kilo, 10 ounce, and one ounce sizes. 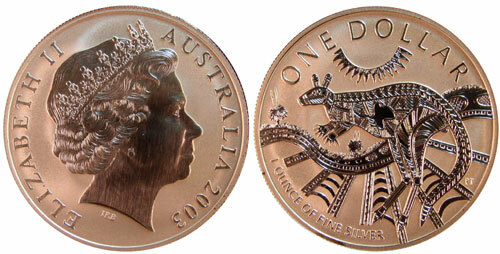 Australian’s second longest-running bullion series was introduced in 1993 and features Australia’s most famous animal. The annually rotating reverse design has ranged from almost photo-like depictions of kangaroos to traditional Aboriginal art designs. Struck in both uncirculated as well as Proof format, the coins popularity has excluded them generally from trading anywhere near silver value, whether purchased from the Mint directly or from dealers. This series is produced by the Royal Australian Mint, while the Kookaburra series as well as several others are produced by the Perth Mint of Australia. These are just a limited selection of the bullion coins that are released annually. The number continues to grow with each year, especially following the recent surge in silver prices and an increased interest in collecting modern world coin issues. The United States Mint introduced a series of five ounce silver bullion coins featuring the designs of the America the Beautiful Quarters starting in 2010. In the same year, the Royal Canadian Mint introduced a one ounce silver bullion series featuring different wildlife designs. Additional series from the Perth Mint include an annual Australian Lunar series featuring the animals of the ancient Chinese lunar calendar and a Silver Koala series introduced in 2007. Russia released one ounce silver bullion coins in a limited quantity in 2009 and 2010, displaying St. George the Victorious on one side. Britain already followed in 1997, but unlike the other coins discussed in this article those coins only contain 95.8% silver, making them less popular than some of the others. Starting in 2013, this composition will be changed to 99.9% purity. Other coins that can be classified in the “silver bullion coin” category include New Zealand Kiwis, Somalia Monkeys and Elephants, Fiji Turtles, Zambian Elephants and Dutch silver ducats. Generally, these are released in limited mintages and sold to collectors at a premium over their silver value. With so many different silver bullion coins available, it is nearly impossible to collect them all. In fact, as we have seen in above, collecting all of the multiple versions and sizes for even one series has become a challenging and expensive endeavor. The question remains- how should one collect them? Obviously, a collector will often limit him or herself to one country, and then further specialize in only one series or one denomination. It truly is open to one’s wishes, especially since new series are created almost yearly, with new collecting possibilities opening up as frequently. 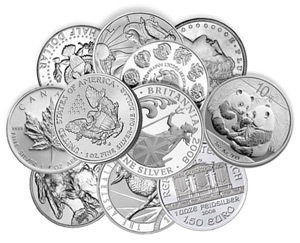 Feel free to add a comment how you like to collect modern silver bullion coins, or if you have helpful advice for beginning collectors who are lost in the maze that is called “modern silver bullion coins”.